Planning for your next holiday in 2019? Here are some of the latest Silkair flight deals and promotions to help you save on airfare. Conditions: Book at least 30 days in advance by 31 March 2019.Promo prices are available until sold out. Prices are valid as of 1 February 2019 and may not always be available. Bookmark this page – we’ll be updating it regularly! With 359 flights per week, Singapore to Kuala Lumpur flights are at their cheapest in March where prices average at $71 and prices pickup towards November and December. Though mostly known for its sandy beaches and water sport activities, Phuket’s appeal also lies on its culture and heritage. The historical remains of Sino-Portuguese exchange sit at rustic shophouses and colonial buildings in the old town. Majestic temples, scrumptious street food and unsoiled jungles make this island a well-rounded travel destination overall and continues to be a popular route for Silkair. The cheapest month to find Singapore to Phuket flight deals is March with prices going for as low as $103. A major tourist destination, prices pick up from April to June and again on October to December. The historic Penang prides itself as the most diverse and multicultural state in Malaysia. Mosques, churches and temples stand tall along the meticulously restored shophouses and clan mansions. Its toothsome food stands true to its recognition as the street food capital of Malaysia, while its breathtaking hills, national park, fishing villages, and durian farms makes Penang completely unforgettable. Prices for Penang flights are cheapest in March, where the average price is $64 as of February. However, prices remain stable through the year. Ticket prices hits their peak in December and February. The charming river city of Hanoi encapsulates a picturesque town with well-preserved natural beauty, evident in its historical and legendary lakes. History lovers will appreciate Hanoi’s vast historical sites, from ancient citadel, French colonial town, to various symbolical pagodas located across the city and villages. From eating delectable street food to cycling along the countryside, the capital of Vietnam is simply an irresistible destination. Hanoi flights are at their cheapest in May where prices average at $182. Another emerging destination, prices peak at July and December. The uncontested beauty of Siem Reap not only lies in its colossal ruins of Angkor Wat and several other equally significant temples, but also in its multi-faceted local culture. If you wish to indulge in scrumptious and surprisingly underrated Khmer cuisine, boating around floating villages, and watching a contemporary Cambodian circus, you have come to the right place. Mesmerising, creative and thought-provoking, Siem Reap will not disappoint you. Prices for flights from Singapore to Siem Reap peak in December. Prices remain flat through the year, averaging at $220 with a slight increase in August and another in December. Unlike some other Indian cities, Chennai’s beauty does not lie on major tourist attractions and stunning monumental buildings. Instead, the capital of Tamil Nadu state welcomes visitors with the laid-back attitude and the rich culture of its locals. From lounging at the world’s second longest urban beach, savouring authentic South Indian cuisine, strolling around historic neighbourhood, to exploring the thriving arts and culture scene, Chennai’s infectious good vibes will leave you with the fondest memories. Prices for Chennai flights from Singapore peak around December and the cheapest month to find a deal is from August to September, where the average price is $233 as of February. Steeped in rich history, Chiang Mai acts as the most important cultural center of Thailand. Meticulously built temples, long stretches of market dedicated to local handicraft, and a vibrant arts scene, the city is perfect for anyone who wants to get inspired. Thanks to its geographical location, Chiang Mai not only takes pride in its lush countryside and winding river, but also its national park which is home to the highest mountain of Thailand. With 4 direct airlines and 15 flights per week, prices for Chiang Mai flights peak in December and February and the cheapest month is March, where the average price is $191 as of February. Note that this route will be transferred by SilkAir to Scoot by October 2019. Kochi’s history as an ancient spice trading port in India makes it a great destination for history enthusiasts. From museums, churches, synagogue, temples to the bustling local markets, Kochi stands out as an exemplary cosmopolitan city. Pristine beaches, scrumptious South Indian food and a thriving arts scene further makes Kochi a well-rounded travel destination. Prices for Kochi flights peak in January and February and the cheapest months are from March to July, where the average price is $212 as of February. Average travel time is 4 hours and 15 minutes from Singapore. The lift of the tourism ban a few years ago has made Yangon an exciting new place for travellers. The soul of the city centers heavily on its holy sites, evident in its majestic golden stupa and enormous marble Buddha statue. Impressive and zealously-preserved colonial buildings stand alongside trendy bars and street markets, making Yangon an exhilarating jumble of sights and sounds. Prices for Yangon flights peak in February and the cheapest month is July, where the average price is $154 as of February. 9 airlines fly to direct to Yangon from Singapore. Average flight time is 2 hours and 35 minutes. Phnom Penh offers a little bit of everything, from walking along the busy markets, marvelling at the architecture, relaxing on a riverside cruise to eating exquisite French-Cambodian cuisine. But, above all, the capital of Cambodia houses a huge remnant of the Khmer Rouge brutality, in the form of killing fields and genocide museum. Whether you are an history enthusiast or not, these sites are not to be forgotten when in Phnom Penh. Prices for Singapore to Phnom Penh flights are cheapest in around July where the average deal is $168 as of February. Ticket prices begin to pick up from November. 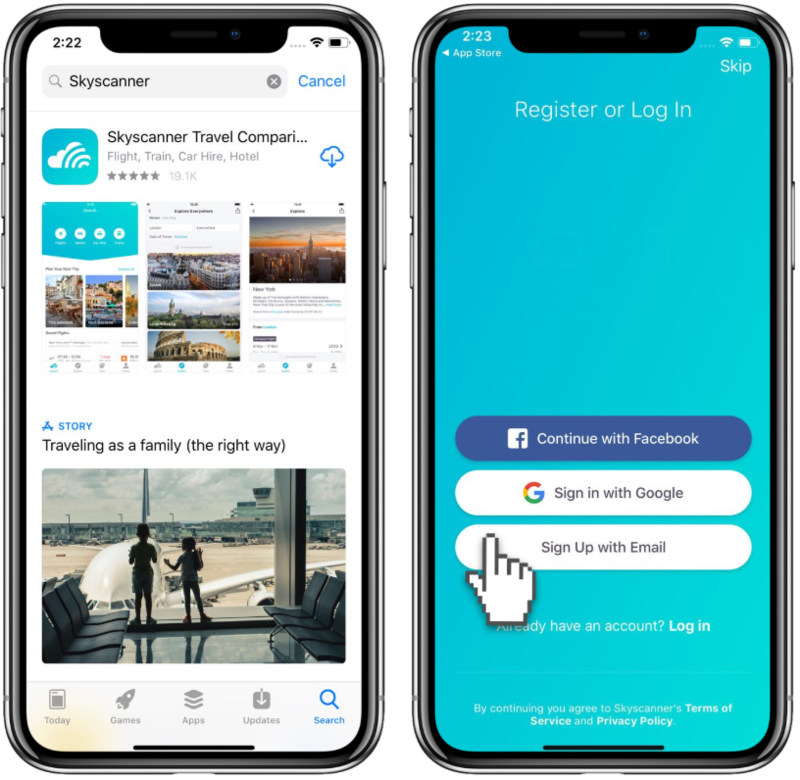 To find the best Silkair promos, start off by downloading the Skyscanner app on iOS and Android. 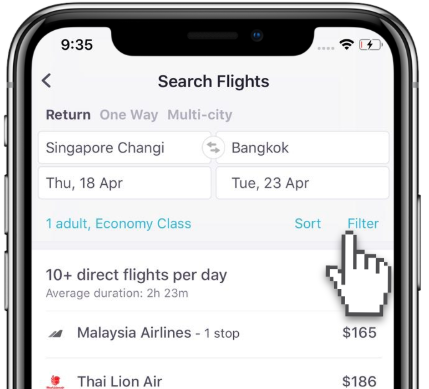 Simply use the airline filter on the Skyscanner app to find Silkair promotion flights. 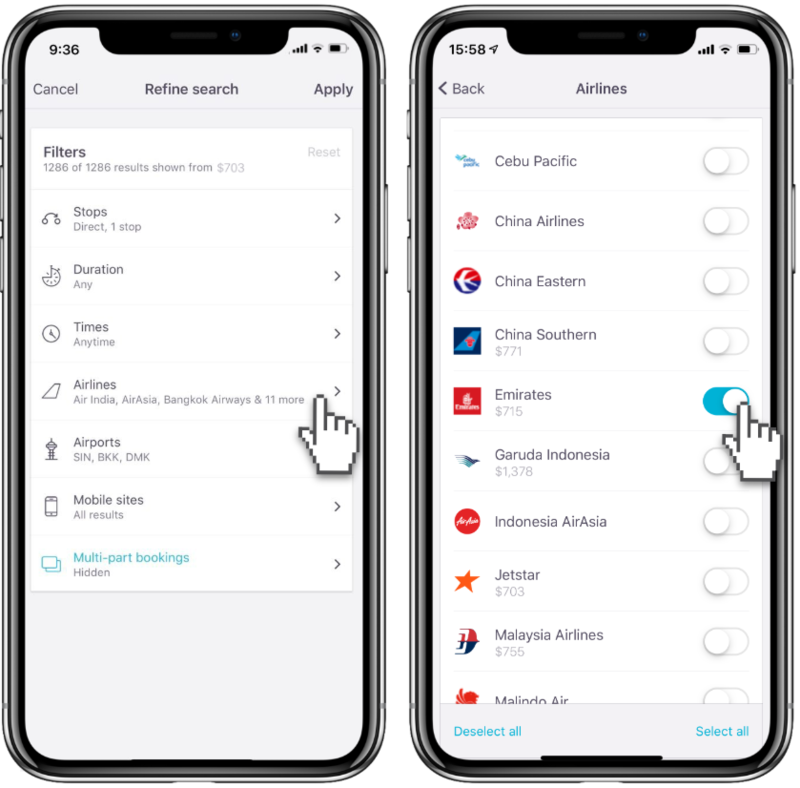 Begin by choosing your destination and dates, and then tap “Filter.” Choose Airlines, and then choose Silkair. 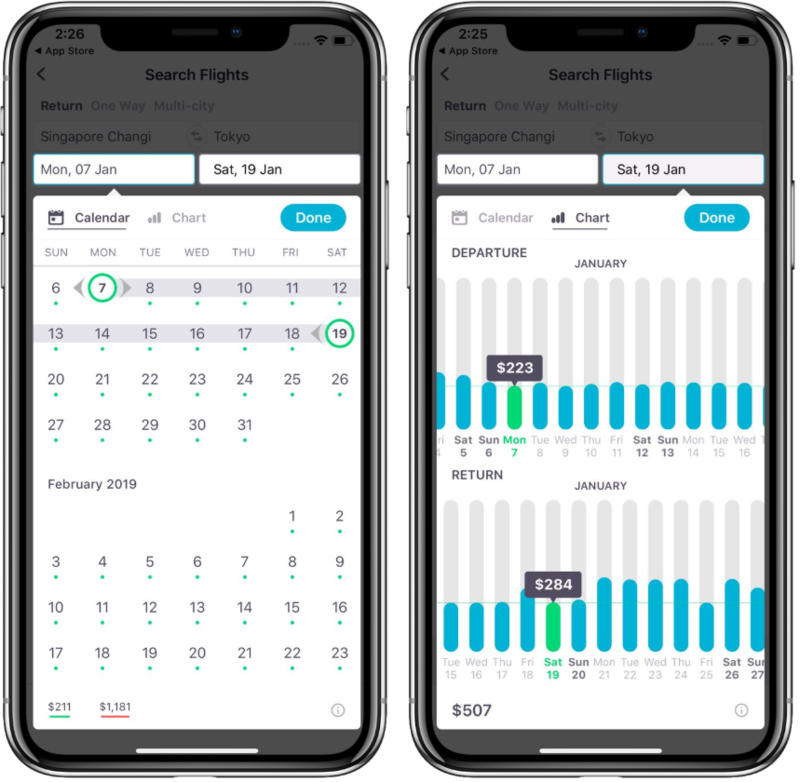 Get the most of any Silkair promotion this 2019 by using the Calendar View to quickly find which dates are the cheapest. *Promo prices are available until sold out. Prices are valid as of 1 February 2019 and may not always be available. The prices shown above are accurate as of 1 February. Destination content written by Skyscanner author Siti Salmi.